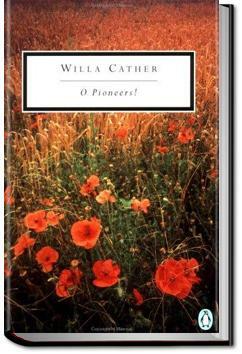 O Pioneers! tells the story of the Bergsons, a family of Swedish immigrants in the farm country near Hanover, Nebraska, (a fictional town near Glenvil) around the turn of the 20th century. The main character, Alexandra Bergson, inherits the family farmland when her father dies, and she devotes her life to making the farm a viable enterprise at a time when other immigrant families are giving up and leaving the prairie. The novel also concerns two romantic relationships – one between Alexandra and family friend Carl Lindstrom, and another between Alexandra’s brother Emil and the married Marie Shabata. . . .Oscar kept looking at Lou as if he expected him to say something, and Lou blinked his eyes and frowned at his plate. It was Alexandra herself who at last opened the discussion. "Any place where things will grow," said Oscar grimly.